Stop your dog from barking? Bach flowers help! All dogs bark. It’s natural. Yet some dogs can’t seem to stop. Some events seem to provoke excessive barking. Think of fireworks, or people passing by your house. Excessive barking may become truly irritating, not only for you but also for your guests or neighbours. It isn’t pleasant for the dog either, because he has to deal with a number of emotions. Dogs are originally pack animals, so when they are alone for a long period of time they can get bored or lonely. This causes them to feel dejected or stressed. To express their feelings, they may bark excessively. Territorial behaviour is normal for dogs. They will want to protect their owner and others from trespassers or other dogs. Barking then is a means of warning. This protective behaviour can become habitual, causing your dog to start barking excessively. Dogs are animals that need a lot of attention. But sometimes dogs may tend to overdo it. They demand your attention by barking if you leave them alone for just a moment. 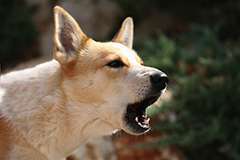 If you get angry, your dog gets the attention he or she was seeking, or you give him or her attention to stop the barking. This creates a vicious circle.